If you create mind maps you may publish your work on Biggerplate, your blog, or on social networks like Google+. Here is a description of how I do it to seamlessly allow other people to download the map. On my iPad I use the app iThoughts HD by Craig Scott, UK, which is the best mind mapping tool for the iPad. 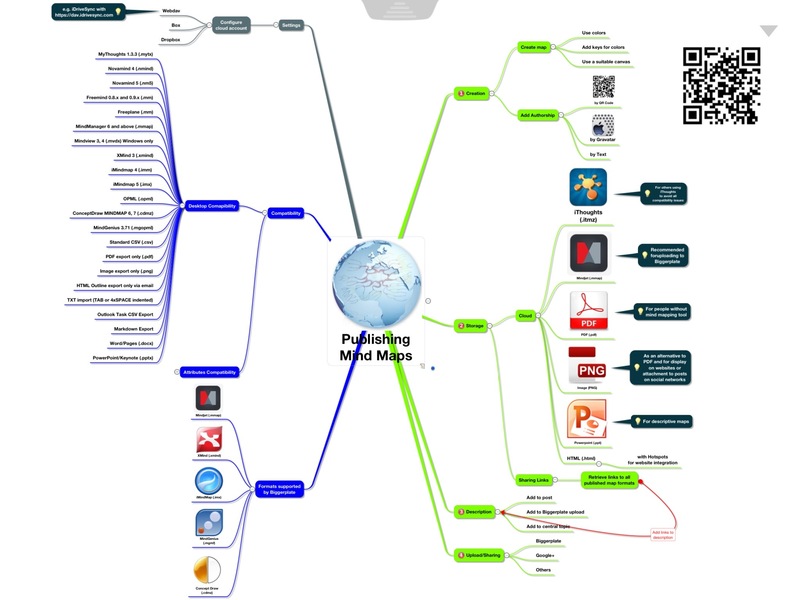 Not everybody uses a mind mapping tool but nevertheless is interested in the content of your map. Compatibility between the different file formats used by min mapping tools is more or less limited. For some maps like feature descriptions it’s useful to additionally provide the map e.g. as a Powerpoint presentation. For maps near to artworks like those of Daniel Tay you should provide the map in PNG file format. Additionally you should know that uploading a map to Biggerplate does not work. The reason is Apple’s filesystem which does not allow direct access to app specific folders or cloud based storages when using the SAFARI or any other browser. The only files you may upload with an iOS device are photos from the camera roll. The functionality is called ‘Take photo or video’ or ‘Choose existing’. Direct uploads from mobile devices to Biggerplate are hopefully possible in the future. It’s useful to save maps on cloud-based storages additionally to the local folder of the app iThoughts. Use Dropbox, Box, or any other cloud which can be accessed by a WebDAV connection like iDriveSync (via hostname https://dav.idrivesync.com). By using a cloud storage you backup your map and you can share it with others as well. Access to a cloud storage can be done in iThoughts when using the function Copy To Cloud. Tap on ‘+’ and enter the credentials for your Dropbox or Box account and additionally the hostname for WebDAV access. To retrieve the sharing link use the native apps for your cloud account. All these apps are free. I prefer Box net and iDriveSync because of the many more features compared to Dropbox and the perfect design of the website for downloads. If your map is created and saved follow these steps. Add links to the files you saved in alternate file formats to improve user-friendliness. Add some information about yourself as text or link to your website or profile e.g. on Google+. See these screenshots to provide appropriate information to Biggerplate. After uploading to Biggerplate dialogs for sharing the map on Twitter and Facebook is automatically available. Sharing on other social networking platforms like Google+, LinkedIn, or Pinterest must be done manually. Use the image of your map (PNG) to illustrate your post and the description to give some additional information to your followers resp. visitors. If you include the PNG file format make sure that all topics which should be displayed in details are expanded and all others are collapsed. The PNG is generated by following WYSIWYG. You should provide all the file formats supported by Biggerplate. This ensures seamless downloads even for people not using the app iThoughts. For mind maps with more descriptive content try out the Microsoft Word format (docx) and the Microsoft Powerpoint format (pptx) which can be imported in Apple’s iWork Suite (Pages, Keynote) as well. Here is an example how mind maps look like in other applications if you use an alternate file format provided by iThoughts. With iThoughts your map can be optionally saved in the file format of Mindjet (IMX). See this comparison between the map within the native app iThoughts and the map saved by iThoughts in Mindjet file format opened by the mobile version of Mindjet. Compatibility regarding layout, sizes, and images is limited but structure and content were retained unchanged. By the way: The desktop version of Mindjet does the task much more better. Present your maps user-friendly by providing different file formats and a comprehensive description. This map summarizes all the main informations of my article. I appreciate sharing this article to your friends and followers.